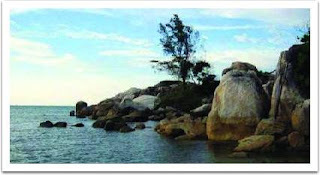 The name Bangka is derived from the word “WANGKA”, which means tin. This word was also written in a Sriwijaya stone inscription dated 686AD and discovered near the town of Kota Kapur in West Bangka. Today this inscription is kept in the National Museum in Jakarta. Bangka is the main tin producer in Indonesia and is also well-known for its white pepper. The group of islands making up the Babel province is almost located on the equator with latitude of 1 degree 30 to 3 degree 07 and a longitude of 105 to 107 degrees east.